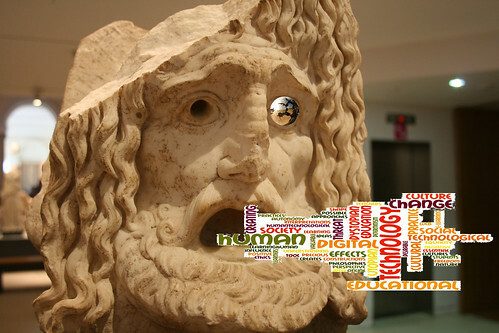 “The Mouth of Truth – no-one knows the truth about how humans and technology relate to each other – all we have are perspectives, ideas and so what is dystopian for one may be utopian for another – hence this obviously ‘fake’ mouth of truth artificially spewing forth words.” – By welshmackem on Flickr. I wrestle with the meanings of words such as ‘knowledge’, ‘networks’, ‘information’ and even ‘education’. I only found out what ‘pedagogy’ meant after I retired from more than 30 years lecturing in higher education. As for ‘critical pedagogy’, MOOCMOOC takes credit for the very little I know about that. Of course I have an everyday understanding but different authors use these words in different ways and I don’t have the theoretical background or appetite to figure out. So I’ve been trying to follow MOOCMOOC but not keeping up with the readings. I started well with Freire but came to a grinding halt with Giroux. I never really got going again but I did find several participant blog posts and comments very relevant and enlightening. A problem with the more theoretical aspects of education or, to be fair, any theory that resists objective verification, is that what individuals absorb may be much more of an interpreted, filtered or ‘cherry-picked’ version than whatever was hatched in the minds of its originators. This is not necessarily a bad thing but it contrasts greatly with some of the technical areas I’m more familiar with. Take Information Theory. Here an entire theory builds on a narrow but mathematically precise definition of ‘information’ leading to deep insights into digital communication and a multitude of useful applications to prove its worth. Theories involving human communication may appear half-baked in comparison, open to interpretation, even inconsistent and their worth endlessly debatable. However, they do attempt to address a far wider range of important and complex issues and when conclusions emerge they deserve to be made comprehensible. Advanced thinkers may arrive at perfectly good and reasonable conclusions through theoretical discussion and debate among themselves but persuading others outside the loop can be a very different matter calling for very different skills. Consider ‘anarchy’. In an enlightening blog post by Sarah Honeychurch she mentions her old supervisor saying, “…the anarchist is not typically found skulking outside the Houses of Parliament with a bomb beneath her long, black coat– the philosophical anarchist is a gentle soul with a belief in the innate goodness of her fellow humans.” Well maybe but the destructive image is probably the one most people immediately think of including myself. I recall anarchists being the first to break away from official routes at political demonstrations, stop non-believers from speaking, start throwing stones, create mayhem and ….. well, anarchy! Words like ‘anarchy’ and ‘anarchist’ carry so much baggage in common usage. The gentle and well-read philosophical anarchist may enjoy a clear vision of what anarchy is about but is unlikely to convince others without choosing words very very carefully. The same consideration applies to today’s politicians. Almost regardless of their political philosophies, few now will openly describe themselves as ‘anarchist’, ‘communist’, ‘socialist, or ‘marxist’ and remain electable. Even the ‘MOOC’ word in the minds of many, now identifies rather negatively with ‘xMOOC’ along with all the associated hype. Some time ago I suggested using Massive Open Online Learning Event (MOOLE) as a neutral and generic term for just about any learning event that’s open and involves large numbers of participants. So, in the first instance, cMOOCs, xMOOCs, or even mass twitter chats and educational games would be simply and literally described as MOOLEs ! Thanks Maha – apart from being abstruse I foumd Giroux too sort of ‘off topic’ for me. Gordon, thanks for this text. I did read and reread it. Part of this problem could be a wide gap between pedagogical theory and day-to-day teaching. Some theories in pedagogics are not confronted with practice and almost nobody bothers about that. Part of the problem is, as you write, the lack of clear language and definitions. Thanks for commenting Jaap. Yes, It can be difficult to know what the practical implications are let alone how to test in the field. I like to see good reports of real teaching and there have been some impressive examples of this in MOOCMOOC. To what extent good teaching is driven by one theory or another I can only guess. I suspect it’s probably more to do with the personal motivation and skills of particular teachers.